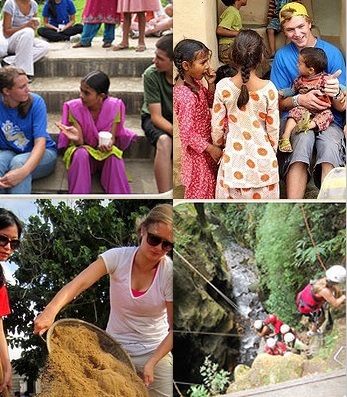 International Volunteer Programmes for Teens | Art of Learning Int Ltd.
YOU ARE THE CREATORS OF YOUR ADVENTURE! Get ready! It is not the summer camp experience! What is expected of you is the initiative, responsibility, team work, well thought through presentations, openness to different cultures, languages and opinions, ability to serve the society with high ethical standards, etc. All this is in English. This is your adventure. Our purpose is to provide you with the environment and the necessary tools to make it a success. Join students (14-18y.o.) from all over the world to take part in short-term summer leadership programmes in most beautiful places around the globe. We believe that leaders are made and not born, and that leadership is a critical life skill that can be developed. Everyone can be a leader who rallies others around a vision or a goal. Programmes are attended by students from over 50 countries; although the main in-take is from the US, Canada, Australia and the UK. Thus, the main language for communication is English. Leadership programmes are conducted in countries with non-European culture in authentic, traditional communities. We work only with students aged 14-18y.o. Our educational programmes are focused on broadening the horizons and self-development of that particular age group. What will make you stand out for the selection committees in such universities as Harvard or Stanford, when they scrutinize thousands applications from around the globe? Despite the widespread notion, the higher grades on secondary school completion may not guarantee the applicant the safe entering in the top universities. Usually, selection committees prefer active candidates, who used their time very effectively both in the secondary school and externally. One of the ways to improve your CV is taking part in summer leadership programmes, which allow you not only to obtain useful life experience but also to prepare an essay with examples of true leadership. Selection committees pay close attention in your CV to such experience as cross-cultural interaction, participation in exchange programmes or summer international internships. Having such experience, gives the university the opportunity to assess your ability to get out of the comfort zone and adapt to the foreign country’s environment and culture. Your developed and proven leadership skills add more weight to your CV as well. 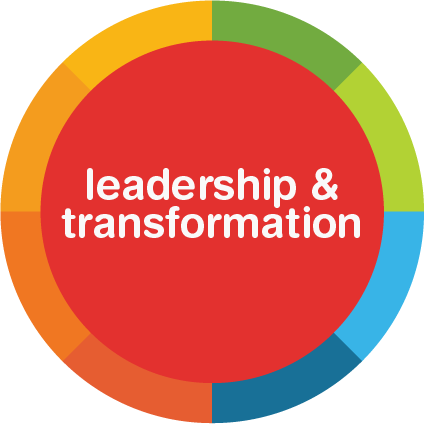 Leadership development programmes give you a chance to get training in project and people management. Additionally, you get the opportunity to take responsibility for the teamwork results. The involvement in both volunteering and leadership programmes make your CV stand out. However, the CV containing such experience as taking part in leadership master classes by renowned international leaders, attending the international conferences and seminars, and public work in developing countries is even much more appealing to the potential assessor. The earlier you start planning your summer holidays the more opportunities you will have to take part in various programmes that suit your interests. The combination of such factors as high grades at school, the right choice of subjects at school, the tailored and professionally constructed CV containing the leadership programmes experience will most definitely assist you to enter prestigious universities anywhere in the world. Welcome to China- one of the oldest, largest and most diverse nations on Earth. China’s complex society and rich culture are a sight to behold, and this is your ticket to a comprehensive view. This is not the China you may have imagined in your mind– but it is rich in history and tradition. 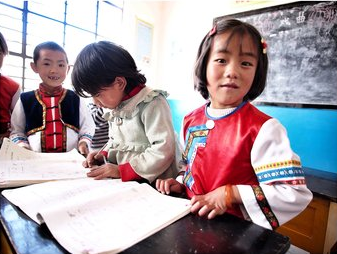 You’ll live in a rural community to get an authentic experience, see China’s incredible countryside, and make an impact on a village school through a meaningful service project. 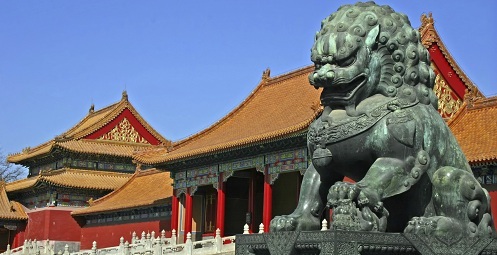 You’ll spend the weekends exploring important cultural sites, including the Forbidden City and the Temple of Heaven. 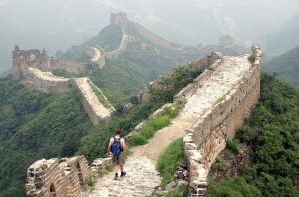 And, of course, no trip to China would be complete without hiking the Great Wall! The Experiential Language Curriculum™ integrates Mandarin language learning into all aspects of the experience, allowing students to take away more of the culture, and also leave more behind. From community service to excursions and cultural events, language is given a new context. Mandarin class will never be the same. Accommodation: Safe and clean accommodation (with gender-segregated rooms); hotel accommodation whilst on excursions. The programme participants will take part in excursions to most renowned places in Beijing such as the Great Wall, Forbidden City, etc. 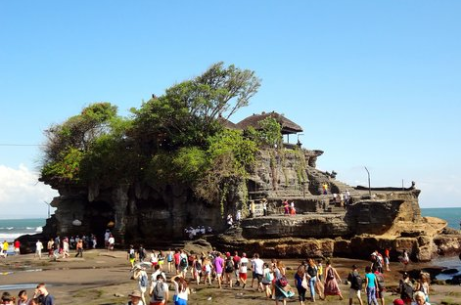 Additionally, participants will have a chance to visit many beautiful places outside of the capital such as the stone forest, famous temples, etc. All this is designed to make the participants acquainted with the great cultural heritage of China through the daily communication with locals. The programme invites you to learn Chinese (mandarin), calligraphy, kung-fu, cooking Chinese meals, participate in culture and history master-classes, meet with Chinese farmers and businessmen, etc. To assist local farmers in their daily work, etc. These islands are some of the most remote places on Earth. Fiji is indeed a tropical paradise. It is also a country with tremendous need. Learn about the settlement of the Pacific – how great explorers crossed thousands of miles of ocean by canoe to settle here. Watch the vast Pacific Ocean devour the setting sun each night. 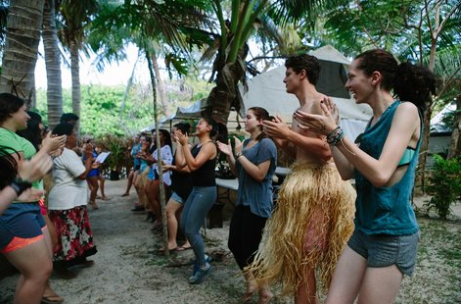 Connect through Fijian music and dance with a culture unlike any other. 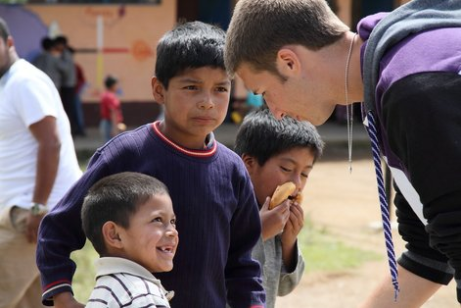 Volunteer at schools facing challenges in providing quality education to children. Work with organizations to protect the environment and combat deforestation. Uncover the complexities of each challenge as you play games with the children and marvel at the diversity of the marine life. 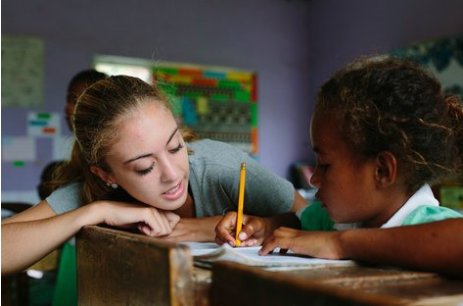 Teachers in Fiji face numerous challenges in their effort to provide quality education for all children. The geographical distribution of the population is a contributing factor. Learn about how rural schools lack proper water and electricity and have insufficient housing for teachers. You’ll become a friend and role model to the children as you teach lessons and work to improve the learning environment at their school. You’ll also assist communities in protecting the environment that is so integral to their way of life. 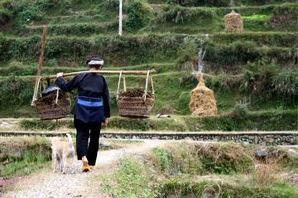 In remote villages, learn what it is like to truly live off of the land. Help community members cultivate fruits and vegetables. Discover the many uses for a coconut and crack it open – if you can! Fish for your dinner. Consider how far other food may travel to reach you. Try your hand at weaving – mats for flooring, baskets and bags for gathering, or hats used to shield the sun. Watch and listen as ancient stories and legends unfold through traditional song and dance. Witness the deep respect this community has for its elders and dialogue with village leaders about the issues facing their community. Gain their perspective and unique approach to affect change for future generations. 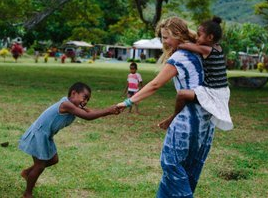 Life in Fiji is a daily adventure. 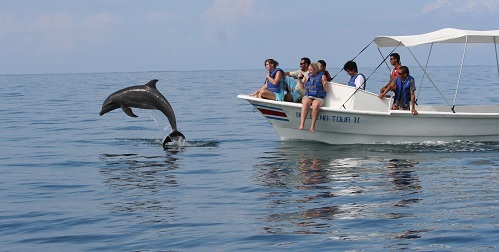 Glide by boat over crystal blue waters and swim alongside pods of peaceful manta rays. 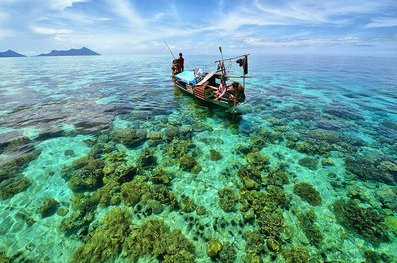 Snorkel over coral reefs teeming with colourful fish as you explore the beauty of the coral’s shapes and colors. Visit a hot natural mud pool and soak in its nourishing powers. Hike to the highest peak in the island chain and see the world from a different angle. Experience the vastness of the universe as you gaze at more stars than you’ve ever seen at once. 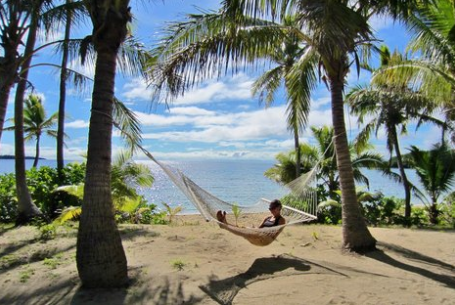 The main Home Base in Fiji is located on a private beach, steps away from the ocean. Students live in gender-segregated beachside bungalows with roommates. 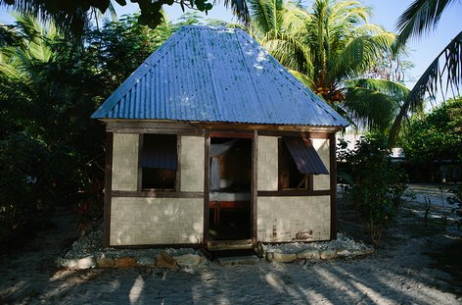 While living conditions are simple, you will quickly discover the rhythm of daily Fijian life. The Home Base is conveniently located near our service site and reflects the flavour of the island. 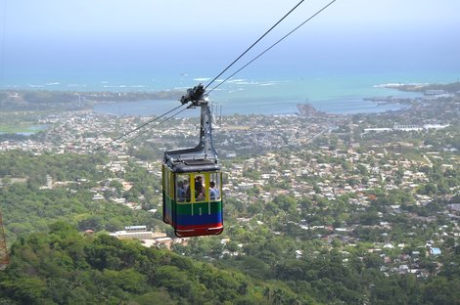 Led by Dave Addison, our International Director who has his PhD in Global Sustainability, the group will meet local leaders who are making great progress on sustainability in the Caribbean. You will be given the tools and support to design your own project as you collaborate with your peers to determine ways to empower change in a Dominican community, as well as in your home communities. You will evaluate the role of natural resources in your life and determine the vital purpose they play in the future of the world. Our group will volunteer on various sustainability projects throughout the country including the construction of schools and medical clinics from recycled materials; we will also assist in the development of agriculture and reforestation systems. In addition, you can share your talents doing arts and crafts, playing sports and games and teaching basic conversational English with local children that our group will meet along the way. We’ll even visit Haitian resettlement villages and brighten the lives of those who have lost everything and now live in the Dominican Republic. 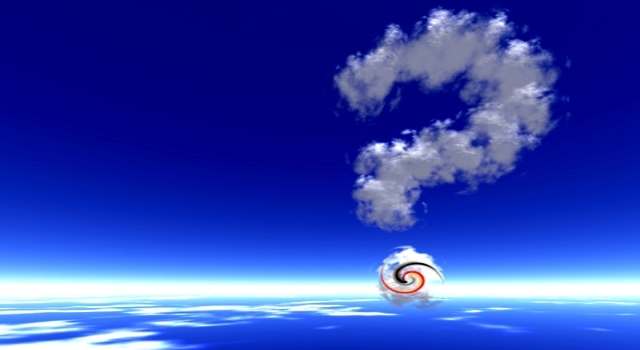 We will explore topics in environmental sustainability, the most critical issue of the 21st century. Through the service work and seminars, you will learn for yourself how to envision and change your life to become more sustainable. These seminars are carefully designed to allow you to make connections between the work at the community service project and issues facing the rest of the world. You will also learn about the vibrant Dominican culture through music, dance, and food. We’ll explore the tropical countryside through long hikes out to remote villages and swims in freshwater lagoons. We’ll ride a boat in the Caribbean, snorkel through crystal blue waters and coral reefs, and sunbathe on pristine white sand beaches. In addition, we’ll explore life in Dajabon, a small town on the border of Haiti with a bustling market and colourful culture. 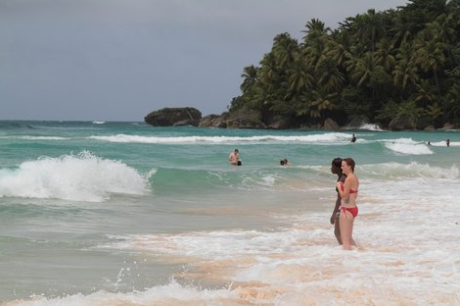 The Dominican Republic is an ideal place for those looking for fun and adventure in the sun while making a difference. 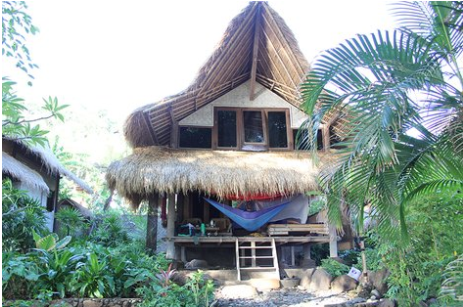 The Home Base is a rustic eco lodge built from locally available materials in the style of the Taino Indians. There is a small swimming pool and it’s right on the beach. Students will have four to six roommates per room. Bathrooms have western style toilets and showers. This Home Base is exclusively used by our students and staff. Discover Cusco, the heart of the ancient Inca Empire, an old civilization shrouded in mystery and tradition. Volunteer with non-profit organizations that work to improve the health and well-being of indigenous children. 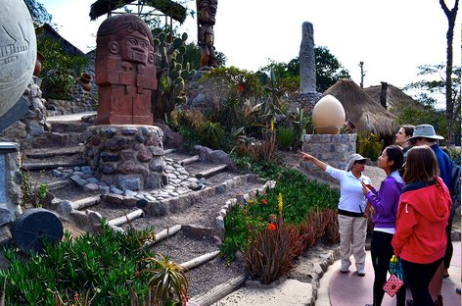 On the weekends, explore the Sacred Valley, go whitewater rafting, and even hike through the Andes mountains to visit Machu Picchu. Our community service projects focus on improving public health for women and children. At one site, we work on a project to build clean-burning stoves to improve the respiratory health of women and children. Students will build a greenhouse at a local school that benefits both native children and their interaction with the environment. These vegetable gardens help to combat malnutrition in children and teach them about traditional medicinal plants. 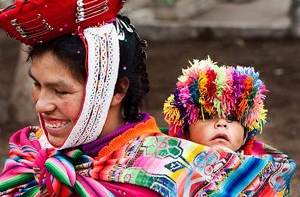 The Quechua people of the Peruvian Andes are the direct descendents of the Inca Empire. 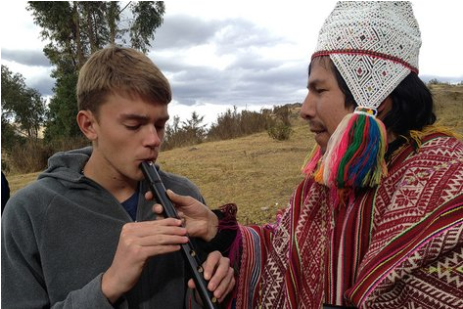 We will learn firsthand about their unique and rich culture through Andean music work- shops, meetings with a traditional shaman, and a visit to a local llama farm. Informally, you’ll experience the local culture through soccer games with local youth, meetings with farming communities and engaging discussions with non-profit organizations. The Sacred Valley surrounding Cusco is full of archaeological marvels built by the Inca Empire. 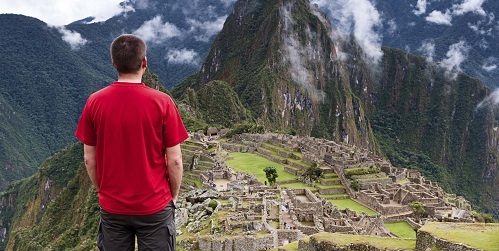 We’ll visit many of these famous sites and even camp along the Salkantay Trail on our way to visit Machu Picchu. 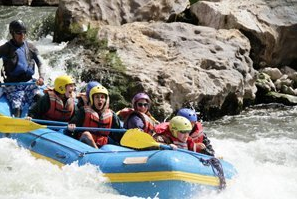 On our 21-Day Flagship program, you’ll also spend a weekend delving deep into the Sacred Valley by visiting ancient ruins and whitewater rafting down rivers winding through the Andes Mountains. 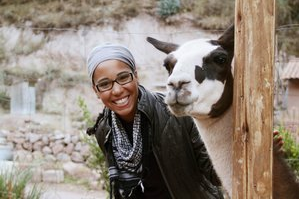 We’ll also visit Pisac, one of Peru’s largest artisanal markets. The Home Base, which hosts the 14-day and 21-day programs simultaneously, is located in a beautiful hotel. There are typically two to four students per room. Our cooks will prepare Peruvian cuisine. During our weekend hiking excursions, students camp in tents provided by the principal. 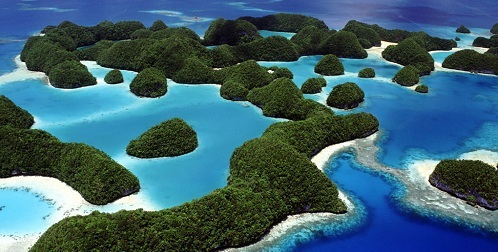 The Galapagos Islands, located off the coast of Ecuador, are so unique that UNESCO has designated them a World Heritage Site. These 19 islands have been called a “living museum” and “showcase of evolution.” While the archipelago has been the centre of attention from conservationists around the world, it is under constant pressure from environmental threats. Come and experience one of the most pristine natural environments where conservationists are working to protect this unique ecosystem. 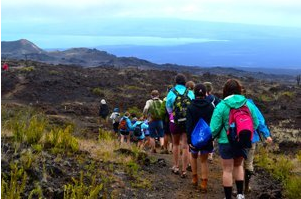 Besides volunteering, you will also have the opportunity to hike lava fields, snorkel with sea lions and explore islands, volcanoes and reefs. 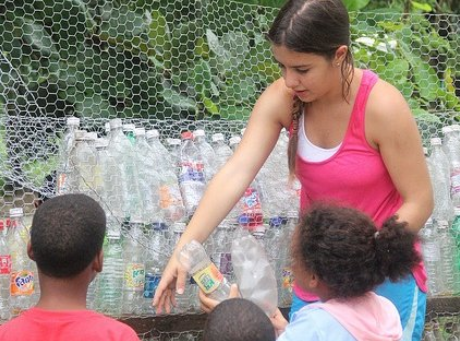 Of the nine days you spend on the Galapagos Islands, six of those days will consist of community service. 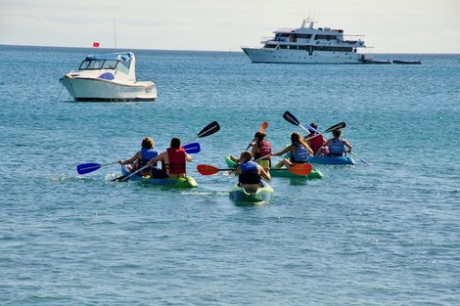 The other three days will focus on exploring the islands and learning about the biology and geology of the Galapagos archipelago. The native wildlife of the islands is in danger because the animals’ natural habitat is under attack by invasive plants, litter, and foreign species. Students work to restore the natural habitat of the animals so that they can reproduce and grow. 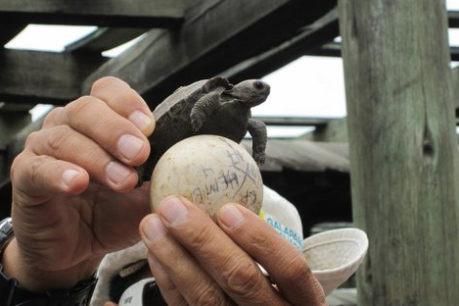 Our projects are in partnership with tortoise breeding centers on the islands of San Cristobal and Isabela. 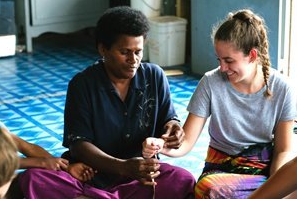 In all programs, students will have the unique opportunity to work on service projects on these two distinct islands. Throughout the program, you will be in a “living classroom.” We will learn about issues related to the challenges of balancing the needs of humans with the imperative for biological protection and preservation. You will also witness firsthand the diversity of species that led Darwin to formulate his thinking on natural selection and adaptation. 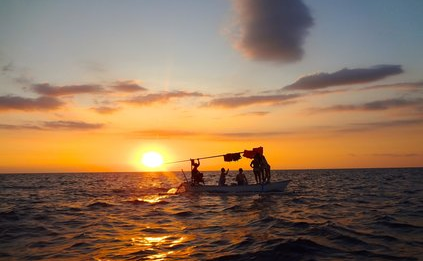 The entire journey will shed light into the history of these islands, human interaction and habitation, and the struggle to conserve the wildlife and fauna of this area. 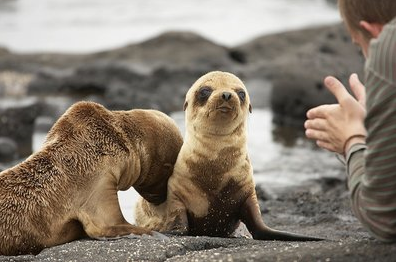 This journey through the Galapagos Islands will prove to be the experience of a lifetime. This is not simply because of the rich and varied diversity of animals that you will see or their staggering numbers, but also because of their sublime indifference to you while observing them. Swim with sea lions and observe blue-footed boobies perched on rocks. The skies are filled with wheeling, courting, red-throated frigate birds. The lava rocks are piled high with motionless marine iguanas. A mind-boggling array of creatures lives in a paradise of crystal blue waters, white beaches and cool mangrove stands. 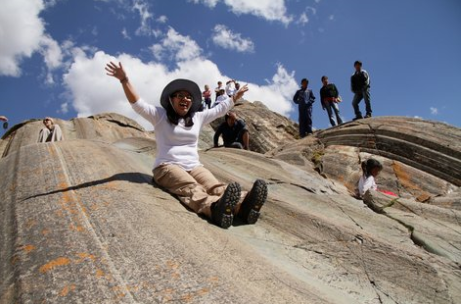 Students will hike up to a volcano and explore one of the five largest calderas in the world. We will swim through lagoons, snorkel through reefs and see wildlife that you have until now only read about. 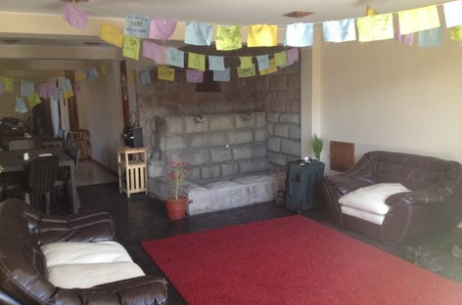 To start and end our journey, we’ll stay at a local hotel in Quito. While in the Galapagos, we will stay on two islands- Isabela and San Cristobal. 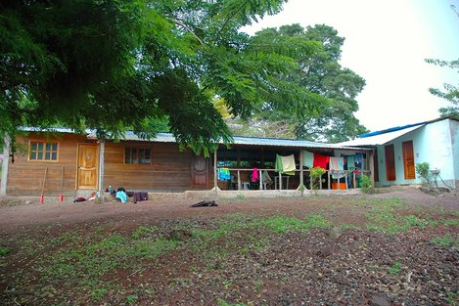 On Isabela Island, we stay at a comfortable hotel owned by a local family. On Cristobal, we stay at a rustic volunteer lodge in the highlands. Step directly into the 4,000 year old world of the Maya: a civilization rich with history, art, culture, and breath-taking mountain scenery. 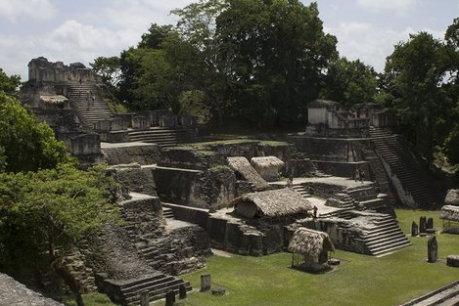 In Guatemala, you’ll learn first-hand about how Maya traditions have both evolved and been preserved through a combination of globalization, civil wars and subsequent peace accords. This Programme integrates the Spanish language learning into all aspects of the experience, allowing students to take away more of the culture, and also leave more behind. From community service to excursions and cultural events, language is given a new context. Spanish class will never be the same. The Experiential Language Curriculum™ integrates Spanish language learning into all aspects of the experience, allowing students to take away more of the culture, and also leave more behind. From community service to excursions and cultural events, language is given a new context. Spanish class will never be the same. You will volunteer at a local school by refurbishing it and working with the children. 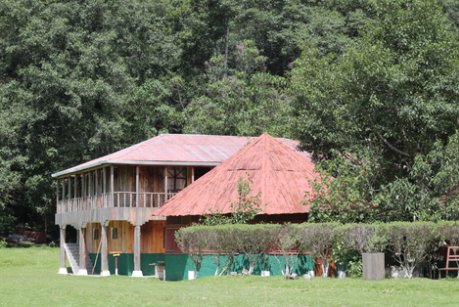 The school is unique in that it actively promotes Maya language and culture. You will fix up the school by painting or building classrooms as well as organizing games with the children. In addition, you can share your talents doing arts and crafts, playing sports and games, and teaching basic conversational English. 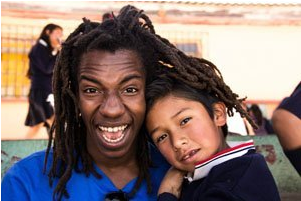 This is more than just a teen community service trip, it’s also an opportunity to connect with a whole new culture. Learning Spanish is best when you can practice it with native speakers in everyday conversation. 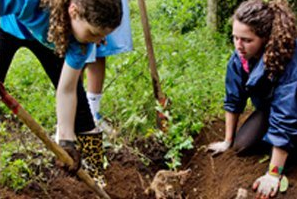 Designed for high school students, the Experiential Language Curriculum™ seamlessly integrates language into many aspects of the programme, including community service, cultural activities, and excursions. Our unique combination of classes and community service allows beginners to quickly learn the basics and gives advanced speakers the confidence to use their skills with native speakers. You will receive 45 hours of Spanish immersion. 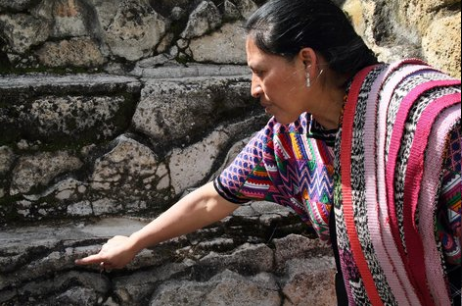 We will also learn about the local culture through hands-on workshops with musicians, artists and weavers and even meet a traditional shaman who will teach us about Maya cosmology. Throughout the program, we’ll embark on a range of adventures and visit many small towns and villages along the way. 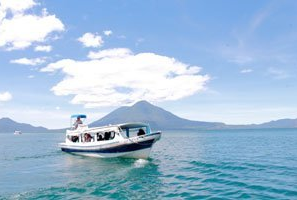 Over the weekends we’ll visit Lake Atitlan, the Maya market town of Chichicastenango, archaeological ruins at Takalik Abaj, organic coffee farms, and the sacred Laguna Chicabal, located at the top of a dormant volcano. During the weekdays, we’ll meet with a traditional music group, visit a Maya artist’s studio, try our hand at weaving colourful textiles and meet inspirational grassroots leaders. 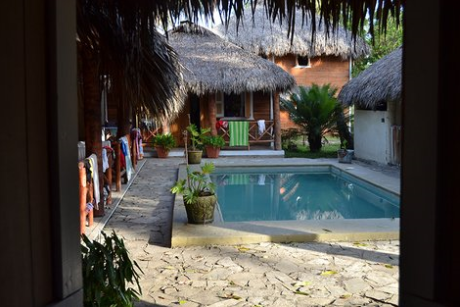 The Home Base is a lodge on the outskirts of Xela offering students a peaceful escape. Students and staff live in gender-segregated rooms with 2-4 bunk beds per room depending on the size of the room. Bathrooms are shared and have hot water. The Home Base is modest yet very comfortable. Ghana is often called the heart and soul of Africa because of its welcoming, passionate, and peaceful people. It is a particularly meaningful nation to visit for many Americans, as it is where a significant number of African Americans can trace their roots. 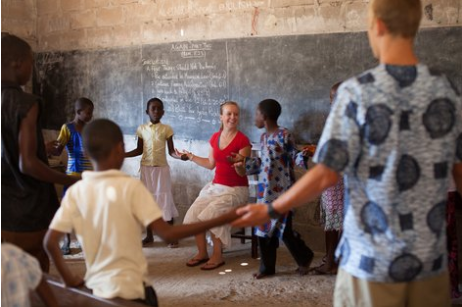 Besides volunteering to help local children, you’ll also immerse yourself in the vibrant African culture through traditional dance, language, and cooking classes. Service is an integral part of this program. 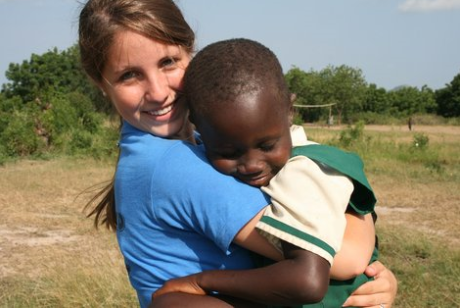 You will volunteer in orphanages and schools working with Ghanaian children. 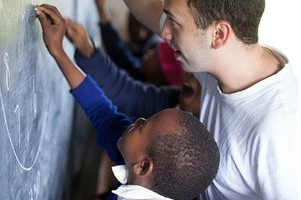 You may find yourself tutoring a group of kids in a classroom with no electricity or even under a tree with only a chalkboard and your own skills to share. Other service activities include making bricks that will be used in the construction of new classrooms and organizing a soccer tournament for local youth. 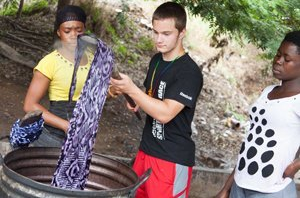 Through a variety of activities, you will become immersed in this rich African culture. 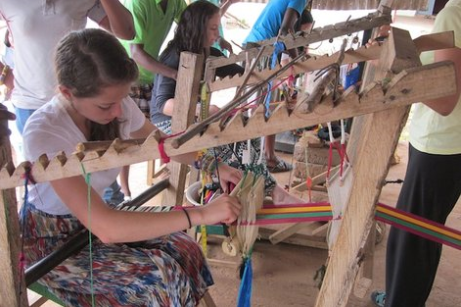 We’ll participate in workshops such as cloth dyeing, drumming, and Ewe language crash courses. Additionally, we will meet with inspirational grassroots leaders to learn how they are addressing the pressing issues facing Ghanaian women and children today. You will have the unique opportunity to meet with local tribe members and chiefs to engage in a deep analysis of traditional religion, the social construction of gender, the tribal system of chiefs, as well as the distinctive history of Ghana. Originally one of the hubs of the Atlantic slave trade, Ghana today has become a peaceful, democratic state. Through host family visits, you will have the opportunity to create meaningful connections and become a part of the rural village community. Experience and learn about Ghana’s rich cultural and historical backgrounds while actively participating in drum and dance, language, and cooking lessons. Explore outdoor markets with unique fruits and vegetables, beautiful cloth, handmade crafts, and world-class beads. 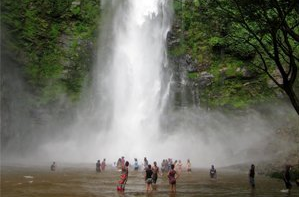 On the 21-day Flagship program, spend a weekend exploring the mountains where we’ll hike to jaw dropping waterfalls and feed monkeys swinging from the lush rain forest canopy. 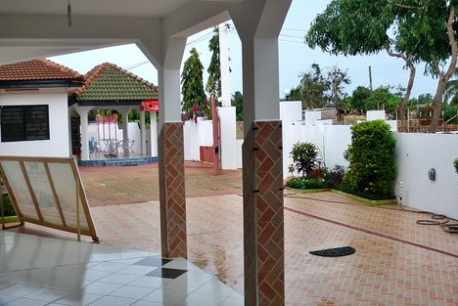 There are two Home Bases; both are located outside of Accra (the capital city) in rural village settings. Accommodations are basic, but clean and safe. Students sleep in gender-segregated rooms with roommates, and have access to shared bathrooms with cold-water showers. Go beyond the movies and discover the real Africa: welcoming people, zebras, giraffes, lions, percussion, Maasai warriors and the astounding Mount Kilimanjaro. Work side-by-side with local leaders in orphanages and village schools. On weekend excursions, you’ll experience the raw beauty of East Africa as you embark on a safari, take in waterfalls near Mt. 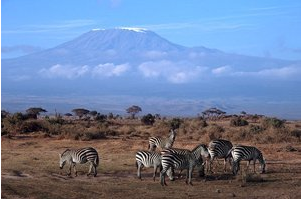 Kilimanjaro, and live among the Maasai people to learn first-hand about their unique culture. As a volunteer, you’ll have the opportunity to improve facilities at a village school from refurbishing a classroom to building a playground. 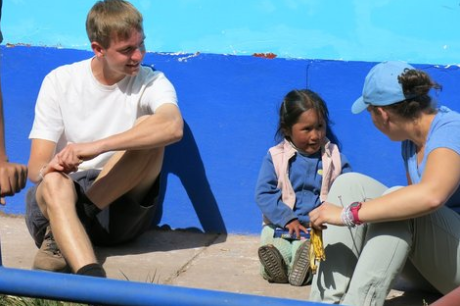 You’ll also form real relationships with the local children as you provide English tutoring and play games with them. You will learn about Tanzania’s rich culture. Specifically, you will experience the traditions of the Chagga people who live around Mount Kilimanjaro, including visits to their coffee farms and banana plantations. You will also learn about and meet members of the Maasai nomadic tribes who follow their livestock and do not adhere to national borders. Although English is widely spoken, you will also learn to speak some Swahili. 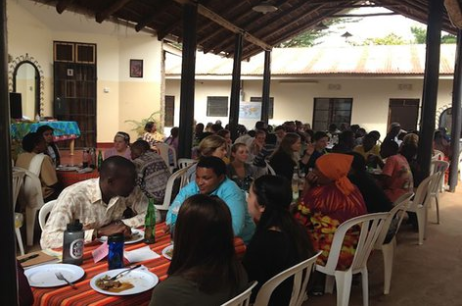 You will hear from guest speakers about social issues facing the community, such as the HIV/AIDS epidemic and the history of East Africa, and even participate in art workshops such as batik and traditional music. 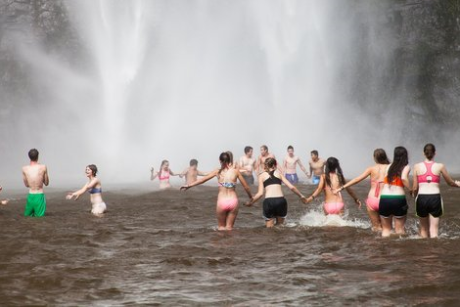 In addition to spending a day hiking near the base of Mount Kilimanjaro to a stunning waterfall, you will also visit some of the world’s most spectacular safari parks. 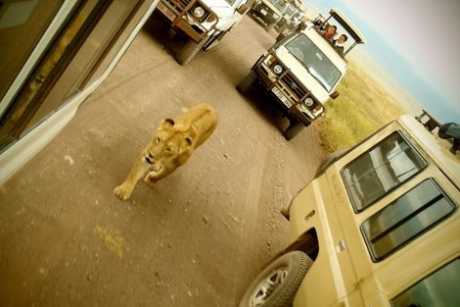 You will visit two of the world’s most famous wildlife reserves: Ngorongoro Crater and Tarangire National Park. During the weekend safari, you will have the opportunity to get up close to zebras, lions, leopards, elephants, wildebeest, rhinos, and many other species in their natural habitat. 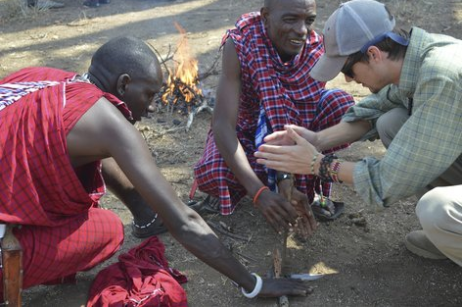 For those on our 21-day Flagship Program, the second weekend will take us to a Maasai village where we’ll be immersed in a traditional community and learn about their unique nomadic culture. Here, we’ll learn to throw spears, make bead jewelry and identify medicinal plants in the wild. There are two Home Bases; both are located 45 minutes from the Kilimanjaro airport in small villages. Accommodations are basic, but clean and safe. There are shared western-style bathrooms and cold-water showers. All students sleep in gender-segregated rooms with roommates. Speaking English unlocks new opportunities for Balinese youth and allows them to discover new horizons. 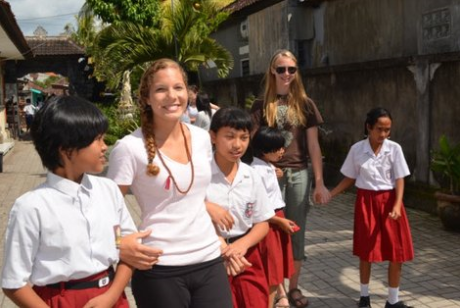 Lead an English class in a public elementary school, just minutes away from the beach on the northern coast of Bali. Create unforgettable bonds with your students as you share crucial language skills. Through service, you’ll interact with the local people and get a rare peek into the culture and daily life of the Balinese. Surrounded by jaw-dropping views, green rice paddies and holy temples, you will immerse yourself in the culture of sustainable, communal living. 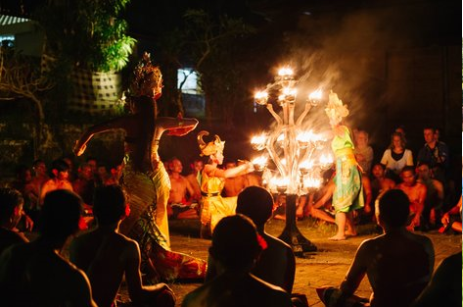 You will attend workshops to learn the Balinese Gamelan drum and Legong dance, participate in an active community dialogue with the Prince of Ubud and play traditional games with local students your age. Every aspect of the program plunges you into the center of this community and culture in order to uncover your own potential. Every day is an epic adventure in Bali, and you’ll spend the weekends and afternoons charting the island and all its breathtaking corners. You’ll quickly understand culture is based on living harmoniously with the natural world. 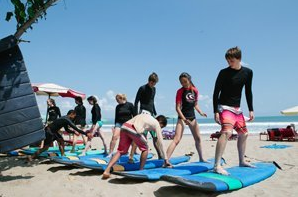 You’ll learn to scuba dive and explore the coral reef, whitewater raft through luscious rice paddies, explore remote temple sites, visit an elephant safari park, and ride shoulder to shoulder with some of the world’s best surfers in Bali’s southern waters. 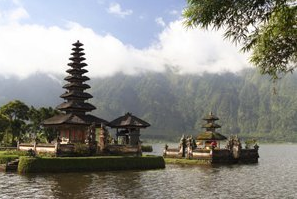 Your home in Bali will be Lovina, a quiet coastal town on the Balinese coast. Seven traditional villages merge to form Lovina, and the coast is fringed by black sand beaches. This fascinating village has all the comforts of home, but has the distinct essence that draws people from all over the world to witness its serenity, beauty, and power. Safety is our #1 priority. That’s why we have implemented the GLA Five-Point Safety System™ to help ensure students’ safety and health and your peace of mind. Each program has a GLA Home Base, a place for GLA students only. It’s their home away from home — to relax, enjoy meals with GLA staff and other volunteers, and reflect. Students room together in gender-segregated group lodging. GLA policy is for no student to ever be by themselves at any point in time. Students should be either with staff members, in groups, or assigned to a buddy. Our average student-staff ratio is 6:1. Meals are prepared fresh daily, with a healthy mix of fruits, vegetables, meat, dairy, and bread. Students may sample local cuisine, but Western-style and vegetarian options are also available. Students also have access to unlimited safe drinking water. 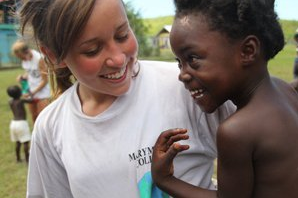 Our in-country staff members have intimate knowledge of the host community. They have established relationships with medical professionals in the area, as well as local organizations where students do community service. Students are transported in GLA-approved vehicles by experienced, licensed drivers. At time of arrival, GLA staff will be at the airport to meet and greet students. If the plane is delayed, they will wait until students arrive. At airport drop-off, GLA staff will help students check in and make sure students know how to find their flight. Is GLA right for me? GLA seeks curious and energetic students from around the world, who are eager to do community service, interact with people from different backgrounds, and learn about other cultures, histories and languages. Any student, 14-18 years old and currently enrolled in high school, including incoming freshmen and graduating seniors, is eligible for admission. 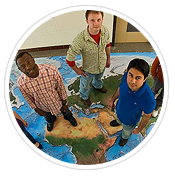 We have students from all over the world, across more than 25 countries in North America, Europe, Latin America, the Middle East, and Asia. Do I need to know another language? English is the primary language spoken on all GLA programs. However, we welcome any students with the ability to comprehend English articles and converse in basic English to join. In fact, many students worldwide use the experience as an opportunity to practice their language skills. Because we value and respect every culture, we encourage students to share their native language and culture with the GLA family throughout the program. For some destinations, learning the local language is an integral part The GLA Experience. Will I get high school credit? Students’ ability to get academic credit varies from school to school. In instances where students can receive credit, GLA will attempt to work with the student in meeting his/her necessary requirements. However, due to the nature of GLA programmes, it is not always possible. Will attending a GLA program help me get into college? After completing a GLA program, you’ll know yourself better and have lots to talk about in your college admissions essays. That’s what colleges look for in a successful applicant. GLA alumni have gone on to attend Harvard, Yale, Stanford, UC Berkeley, and other schools. 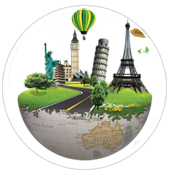 You are welcome to purchase any flight that arrives in the destination country on the first day of the program. As long as you arrive on the arrival day, our staff will pick you up at the airport. Once you enrol in a program, we will provide exact information about which airport to fly into and any restrictions in terms of arrival times. Can I travel with other students? For students coming from the USA who wish to fly together with other students, we offer a suggested group flight itinerary for each program. This flight departs out of a US gateway city. This is not a chaperoned flight, but students can meet at this gateway and fly to the destination country together. Once you enrol in a programme, we will provide the suggested group flight information to you. Whether or not a student needs a visa depends on his/her country of citizenship and chosen GLA destination. Therefore, students must check on particular travel to destinations/countries’ visa requirements before booking the programme. All GLA students need passports valid for at least six months beyond the last day of the programme and with at least one full empty page (to allow for an immigration stamp upon entry at the designated destination airport). We always suggest packing only the essentials. That includes any prescription medication or other daily necessities. Our student coordinators will provide a detailed packing list tailored to the specific program you are attending. Do I need special health insurance? All programme fees include insurance coverage. The insurance policy covers each student from the moment he/she joins the group at the GLA destination airport or arrives on our campus, whichever comes first, and continues until the end of the program. The insurance policy includes medical, travel, and accident insurance. Full policy details will be sent to GLA students as part of their acceptance packet. What other medical information do I need to know? GLA team members have implemented all necessary precautions to avoid diseases, including providing clean running water and hygienic surroundings. Although our home bases are located in regions that are relatively safe from diseases, we do recommend getting the latest region specific vaccines. In fact, some destinations require certain vaccinations to enter the country. In additional, all GLA programs have an adequate number of staff certified in First Aid and CPR. Will male and female students live in the same facilities? No. We always have gender segregated rooms. Laundry is not available on 10 day programmes so students are asked to pack accordingly. Each country has slightly different laundry facilities, but in general, students’ laundry will be done once a week on longer programmes. 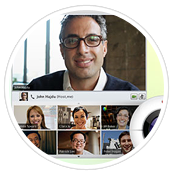 What if a parent needs to contact a student? Parents are encouraged to contact their children via email. Parents will also have access to the 24/7 emergency phone number while your student is traveling and on a GLA program. One of our HQ staff will be available at all times to help you with any issue that should arise. Parents will also have access to our Directors phone number in country in case of emergency. Will students in the programme be supervised heavily? Yes. We believe that supervision is important to ensure student safety, and our staff will supervise students during all day and evening activities and in the accommodations at night. We are proud of our experienced staff and know they will do their best to maintain the students’ safety. 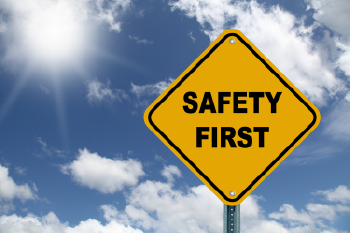 However, because staff cannot watch every student’s actions 24 hours per day, it is important that students respect the safety rules provided to them. Yes. Safety always comes first. The primary goal of our experienced staff is the safety and welfare of the students. We take great pride in providing safe environments for students to explore these beautiful cultures and learn from one another. Upon acceptance into a GLA program, each student will receive a confirmation packet, which includes the GLA Safety Rules and Contract, or the Code of Conduct. This contract must be signed by each student and their parents, and returned with the final payment. All rules are designed to keep the students safe, while still giving them the freedom to make the most of their experiences. Can you make dietary accommodations? We try to accommodate our students’ dietary needs, such as providing vegetarian, no pork, no fish options, and are sensitive to the importance of retaining a vegetarian, Kosher or Halal diets. However, some needs may be difficult to accommodate, particularly when traveling. 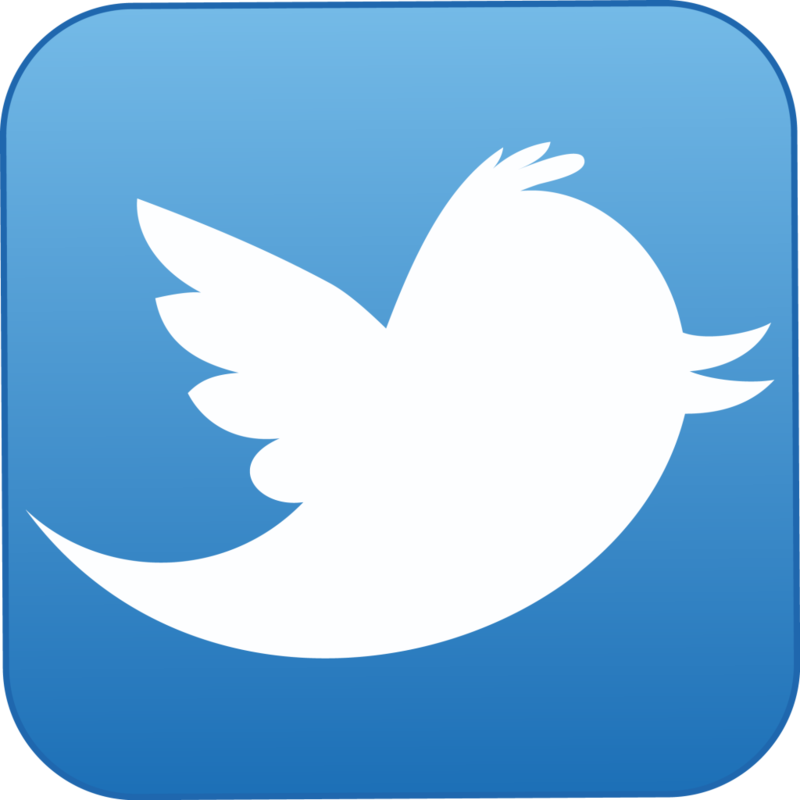 We encourage you to contact us if you have questions about specific dietary concerns. Can you make religious accommodations? While we strongly encourage students of all faiths to join Global Leadership Adventures and contribute to the diversity of the student body, students cannot skip any part of the programme, except for medical reasons. That includes observance of the Sabbath or other religious holidays. Unfortunately, GLA programs are unable to provide avenues for worship, though we can accommodate some personal time on-campus for spiritual reflection. Will student-athletes be able to prepare for fall sports? We recognize the importance of athletic training for many students, particularly for those who are preparing for fall sports and for those whose sports contribute to their college admission prospects. Although The GLA Experience will greatly contribute to students’ development in many ways, it is not a sports programme and does not allow for serious training. Our schedule includes a modest amount of free time most days and the option for group sports several times per week. We generally use this time to expose interested and previously uninitiated students to popular local sports ranging from soccer in Costa Rica to a sports camp in India. 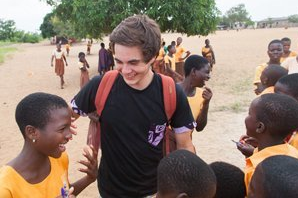 The Global Leadership Adventures application process is not meant to exclude students from our programme. Rather, it is a time when our staff can review each applicant’s motivations, expectations and character to see if they would be a good fit for our programme. The application process allows us to make sure that the students’ motivations and expectations are aligned with what our programmes offer. Students are required to submit an application (online or printed) which includes a non-refundable $75 application fee and a $400 deposit ($475 total). In the event you are not accepted into the programme, we will refund the $400 deposit immediately. The $400 deposit is refundable until 5 months before the start date of your programme. After that the $400 deposit is non-refundable, per our cancellation policy. Once the completed application is submitted, our staff will review it within two working days (Monday-Friday) and you will receive a reply via email. Once accepted into a programme, one of our coordinators will work with your family to make sure you have everything you need for the programme and will also provide guidance on how you can obtain plane tickets, visas (if necessary), international cell phones and immunizations (if required). *Please Note: there is a $25.00 fee for each Returned Check. 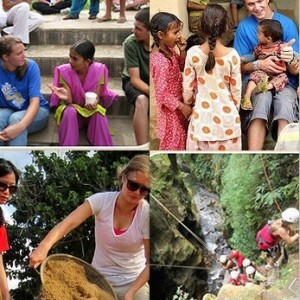 The tuition for every Global Leadership Adventures program includes the entire in-country experience. From the moment the student arrives into the country and is met by our staff, all program costs are covered by the tuition. For all participants who enrol prior to December 1, the final tuition will be due by December 31. For all others final tuition is due 30 days after enrolment. Certain portions of the programme fee are refundable depending on the date of the cancellation request. If a student chooses to withdraw for any reason prior to the departure, GLA must be notified in writing. The refund will be calculated according to the date in which GLA receives this notification. NOTE: Families who have purchased trip cancellation insurance will be refunded by the insurance company until the departure date of the program. If you have additional queries and requests, you may send them to info@artoflearningint.com We will make our best efforts to respond as soon as possible! Самое важное, чему я научился – это как нужно эффективно управлять группой. Во время моей программы, каждый студент должен был стать Старшим по группе на один день. Во время моего дня лидерства и наблюдая за другими я понял, что для того, чтобы руководить, нужно ставить убедительные цели, четко объяснять что должно быть сделано и разобраться как лучше расставить людей по участкам согласно способностям. Для меня программа показала мир в самой его неприглядной бедности, но в то же время дала надежду на то, что я могу сделать очень много для того, чтобы сообщества, в которых мы жили имели лучшее будущее. Я видела улыбки детей, среди экстремальной бедности, которой я никогда до этого не видела. Мой опыт и осмысление этой программы легли в основу двух эссе, которые я подготовила для поступления в Гарвард и обсуждала во время интервью. Программа заразила меня страстью к международным отношениям и дипломатии потому что она дала мне уникальную возможность смотреть глужбе чем слова, фотографии и статистика и испытать погружение в новую культуру. Общественная работа и полное погружение в жизнь деревни заставили меня использовать испанский язык и научится быть по настоящему международным. Сейчас, в университете я учусь на факультете Международных отношений и Экономики и надеюсь стать юристом по международному корпоративному праву. После участия в программе я научилась ценить вещи, которые раньше воспринимала как должное. Академия открыла мне глаза на то, что на самом деле главное. Видя индонезийские семьи в бедности я осознала, что каждый день они борются с проблемами, которые даже не приходят на ум американским тинейджерам. Например, чем я сегодня буду кормить моих детей или где я сегодня буду спать. Это помогло мне понять что все то, что я называла проблемами, вовсе и не проблемы и нужно перестать жаловаться на трудности. Программа окрыла мне глаза как на новые уголки мира, о которых я раньше и не знала, так и на проблемы взаимоотношений на стыке культур. Те люди, которых я встретила в Академии – дети, лидеры сообществ и фантастические директора программ и менторы – научили меня вести себя как настоящий гражданин мира в университете и, надеюсь, в моей будущей карьере.